Fancy a fitness tracker but are a little short of funds? Well, the Jawbone UP2 may well be for you. The entry level fitness band launched a while back in the US and is available right now in the UK. The Jawbone UP2 is £89.99 in the UK (it's $99 in the US) and is a successor to the chunkier, now discontinued, Jawbone UP24. Jawbone is quoting a 45% reduction in size, and it's also a tad smaller than the forthcoming, rather-too-long-awaited UP3, although it lacks that model's heart rate monitoring abilities. The Jawbone UP2 lasts up to seven days on one charge, counts your steps, has a stab at detecting more vigorous exercise, and will also inform you about how badly you're sleeping . 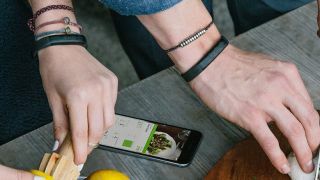 Jawbone Smart Coach, part of the UP app for Android and iOS, is then on hand to offer up fitness tips like, "Put down the takeaway, get off the coach and get some exercise you lazy fool." We may be paraphrasing a little here, but it will seriously tell you to go to bed earlier, to eat better and to rehydrate more diligently. If you want to see the competition that Jawbone is up against, then check out our Best Fitness Trackers article. Warning: it will make you feel even more unfit than you are right now.